Remember the last time you were on bicycle? 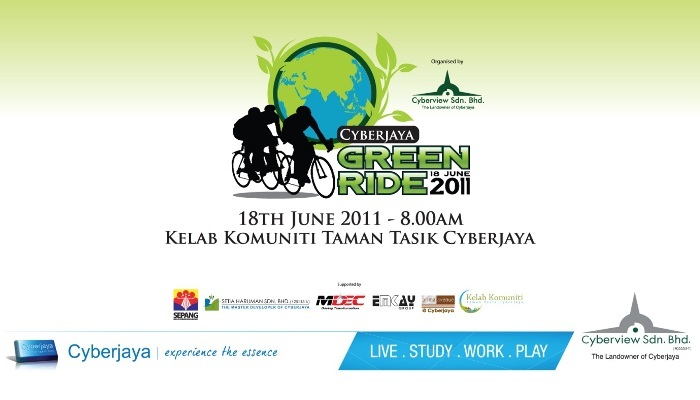 Guess what, Cyberview and other stakeholders of Cyberjaya is organizing the first and foremost Cyberjaya Green Ride 2011! Get yourself on your favorite bike and feel the vibe and excitement through this green journey! You never know you might be among the lucky winners! Those who are interested to participate, please download and fill in the entry form and revert back to the organizer before 15 June 2011. Should you need further information, please contact Mr. Roshdi Zakaria at (03) 8315 6048 of Cyberview Sdn. Bhd.